All things that player must know or can be of their use such as general information, policies, rules, FAQ, guides and instructions, various language translations. This guide assumes that you are already working on a transfer application. If that is not true and you're just getting started, go to the Transfer Manager and open the How to Transfer guide. If you are already working through the transfer guide but want a sample image to understand what you need to submit, read on. 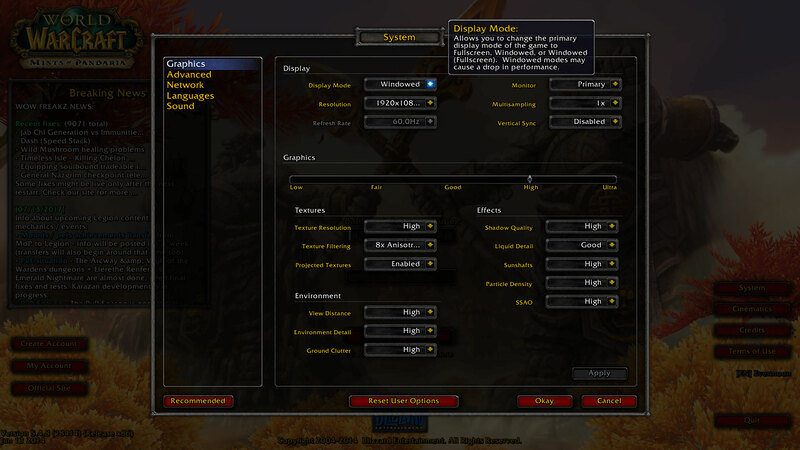 You will need to log into your retail game account on Blizzard's realms, but do NOT need to go past the character selection screen for this image. That means you can transfer even without an active subscription! Activate windowed mode, have the TrueWoW transfer page visible in the background, and select the character you intend to transfer. Only staff can review these photos and they are purged when a transfer is processed, so please do not blur/obscure/cover/alter anything in the photo in any way. Remember to upload your image to Imgur once you're done. 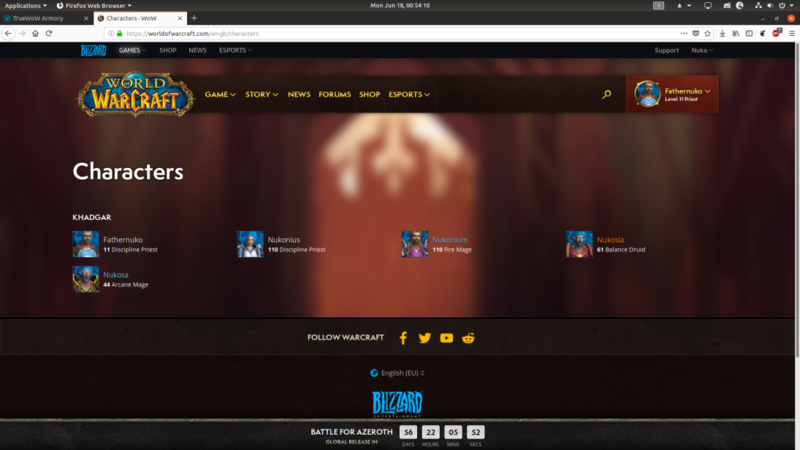 You will need to log into your World of Warcraft account via the Blizzard website for this image. Go to your character list and take a picture such that we can see the character who was hilighted in the first screenshot. 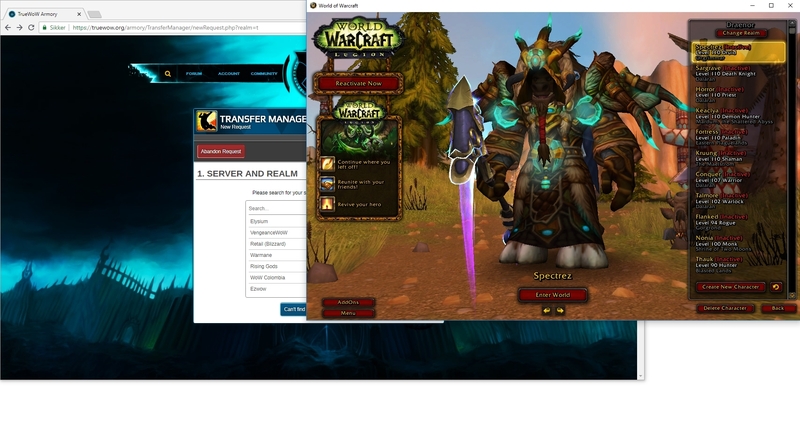 You should still have your TrueWoW transfer application open in another (visible) tab and again, please do not blur/obscure/cover/alter any portion of this image. Remember to upload your image to Imgur once you're done. If staff does not see all requirements present for a given screenshot, they will send you a feedback request, which will notify you via PM. You may need to recapture one or both images, reupload them, and resubmit them for review. If you have trouble taking a screenshot, see some tips below! If staff believes with reasonable certainty that an invalid screenshot was a purposeful attempt to defraud the transfer system, you run the risk of being suspended, banned, or blocked from transferring any characters. Not sure how to get to Windowed Mode? Press "Esc" --> "System" --> "Graphics". The option called "Display Mode" should be set to "Windowed." Thanks to Nyeriah for showing how to make this possible on modern WoW clients! There are many popular methods for capturing the current screen. To capture an image using Print Screen, get the screen ready. Once it looks how you want staff to see it, hit the "Print Screen" button on your keyboard. It's usually near the top right of the keyboard. You will then want to open Paint and paste (CTRL+V or the Paste button). You should see a snapshot of your screen insert itself, and can save this file to your computer as a JPG or PNG file to upload to Imgur. There are many popular methods for capturing the current screen. To capture an image using the Snipping Tool, get your screen ready and then open the Snipping Tool software from your computer. It should be automatically installed on most Windows computers. Click the "New" button to take a snapshot of your current screen (minus the Snipping Tool box). The screen will turn a gray color and you can click and drag the mouse to highlight the the portion of the screen you'd like to keep for the image. Once you release the mouse button to confirm your selection on the screen, you can view a sample of the area you've selected, and click "File" --> "Save As..." when you're happy with it. From here you can easily save a PNG file to upload to Imgur.